Last year, Green Flash Brewing out of San Diego acquired (partnered up, etc) with Alpine Brewing out of Alpine, CA. Alpine is known in the craft beer world for making some of the best IPA's on the planet. I've reviewed a few of them myself. The acquisition made it possible for Alpine to not only produce more beer, but it allowed them to give their employees benefits like a 401K. Originally, the Alpine beers made at Green Flash were to remain in California only, but, for reasons unknown to me, it appears that all of Green Flash's markets are now starting to get the Alpine beers made at Green Flash. Even some of my local stores in Southeast Massachusetts have begun receiving Alpine beers. Needless to say, the craft beer community was up in arms over the acquisition as they immediately thought that the Alpine beers made at Green Flash would not be anywhere near the quality as the same ones made at Alpine Brewing. As I said, I have had several of Alpine's beers before the protested "merger"and they were all fantastic. 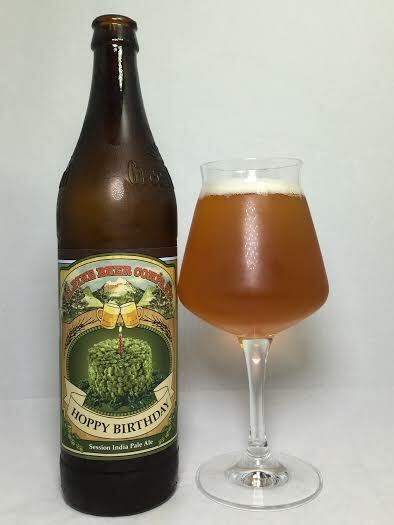 Today I have Alpine's Hoppy Birthday, which I have never had before (Alpine or Green Flash) and yes, I do have the Green Flash version.. It markets itself as a session ale, but all sites I've visited call it an American Pale Ale made with six different hops. I'm never one to let the public tell me how to think, so I will just let the beer itself do the talking. Pours a beautiful, glowing orange which is mostly transparent. It produced a finger of white head. Aroma has that classic west coast IPA garlic and onion, but also a big pine sap kick and a sweet, candy-like smell too. The taste is predominantly pine, but it's still not all that flavorful as it doesn't really burst onto the palate with authority. It's present enough to be noticeable, but still slightly faded. The back end actually transitions nicely to the aforementioned sweet, candy flavor reminiscent of Spree or Skittles. That finish helps even out the intense (surprisingly intense for the abv and style) bitterness that is experienced at the front and especially in the middle of the mouth where the dank hops and onion seem to be clinging to my taste buds. Some of the onion/garlic can get heavy at times, but at the same time, it is impressive how big of a punch the hops are for a 5.25% pale ale. Mouthfeel is full and not thinned out or watery; it's spot-on for the style. Some of the bitterness is getting a tad bit cloying, but again, the sweet finish makes the save and ends up making this highly drinkable. Hoppy Birthday had a surprising amount of hop bite, but that west coast garlic and onion would have spoiled the party if it wasn't for the 11th hour save by a nice, fruity, candy flavor. This actually drinks bigger than 5.25% thanks to a full body and flavor contribution from all of the hops used. It's nice to see some pine in a west coast beer, but the pine itself could have been a little more intense. Regardless, this pale ale has all the hallmarks of a west coast IPA, but for me, it drinks easier than what I've come to expect from other offerings from out there.